This is the underground photo of what is the central point of Delhi. I tried to capture the circular construction of the above-the-ground - Connaught Place, which is a circular market and considered to be the central point of Delhi. 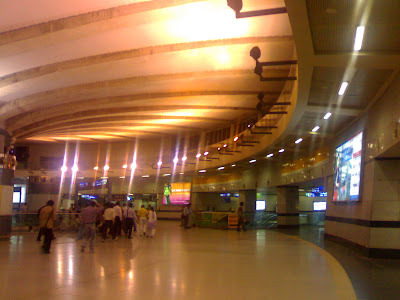 This Metro Rail Station is called Rajiv Chowk. Rajiv is the first name of our former Prime Minister Rajiv Gandhi who was assassinated in 1991. Chowk means a square. After visiting this blog i came to know that i need visit New Delhi once again. that looks good! Do we have shops in these underground railway stations? I heard they were planning to come up with malls in these underground stns. Hmmm... Couple of years ago, when I took a photo inside a Delhi Metro station, I was accosted by a cop who wanted me to expose the complete roll of film... things have changed!